KoopaTV: What's the deal with Undertale's popularity? By LITTLE FRUINI - The reason lies in all the obsessed fanbases all over the web! As those who follow KoopaTV already know, Undertale has been (actually, it IS) a virus for the Internet, whether you go on YouTube or Twitch and see streams and Let’s Plays for the game (something that is frowned upon here), or to the obvious Tumblr and Reddit populations and see players with their fan arts, findings, or post on their next target to invade. Most notably, the game has gone hoops under and over winning the respected title of GameFAQs’s Best Game Ever with an underwhelming victory. Underappreciated jokes aside, there is one thing to blame, and if you don’t know why, then I recommend you to read the subtitle. That’s right: the fanbase. I’ll give Undertale the benefit of a doubt and say it really IS a good game, with its witty dialogue, music, and visuals (I haven’t played the game, so I may do it injustice), as everyone says. However, it’s a shame, because the game could be a cherished diamond shared and replicated by many. For lack of a better simile though, some just keep talking about how beautiful the diamond is and how they keep finding new things in it. For a comparison, some fanbases are tame, while others have this website that they all like to log on to, hang out, and talk about how valued a game is (EarthBound’s very own Starmen.net is a great example). And even if everyone approaches a game in a different direction, Undertale's fanbase is simply an entire different story. For reference, let’s take the first battle that Undertale had in GameFAQ’s ‘Best Game Ever’. 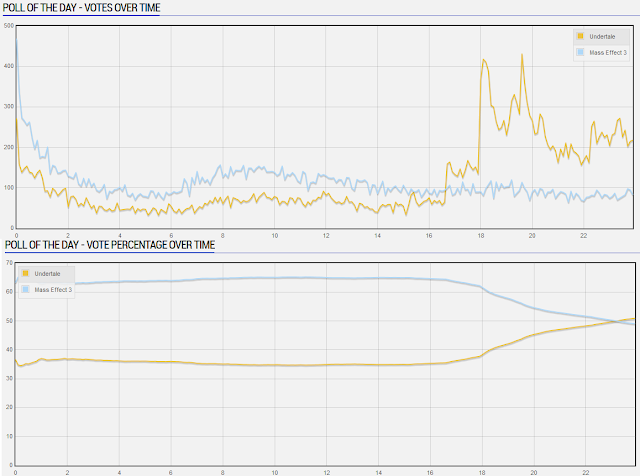 As you can see, these aren’t users natively from GameFAQs, they’re actually people from a rally, and if that wasn’t the case, then there shouldn’t be a spike in the charts! This wasn’t the only time this has happened. Five Nights at Freddy’s had the same treatment in its release, being played by every noticeable “personality” greater than one million subscribers/viewers, and Flappy Bird got the same amount of treatment (although I can’t exactly explain how; both are different games). So we know this has happened before, but my point is that the Internet is a huge influence on gamers. I’m not simply saying that, because I’ve got undeniable evidence that will unravel your socks (and yes, I’m probably pushing it). I have done a survey back in November asking people on their thoughts on the video gaming industry lacking innovation or not (which is an article for another time), but I’m focused on one question: How did you know about your favorite game? 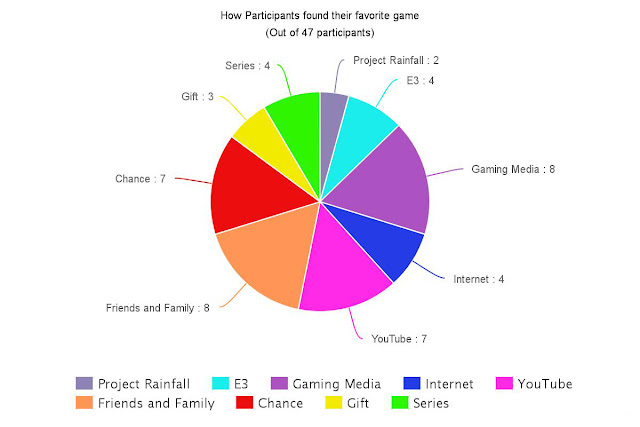 This was the only question that participants could CHOOSE to answer, but for those that did (excluding the “I don’t know” responses), 25 out of the 47 who responded mentioned E3, Project Rainfall, YouTube, or unreliable gaming websites (IGN, for instance). Personally, I consider everything on the right-half to involve the Internet. This chart isn’t mentioning extra factors, like how a participant’s friend knew about their favorite game (that, or I’m digging too deep). Now let’s talk about Undertale’s fanbase. Right now, they’re pretty calm, until you go to a popular channel like The Game Theorists to see comments on Undertale, or travel back in time (or watch a video; your preference) to experience the tiny victory Super Smash Bros. Melee had only to be taken away. Their efforts are very strong and effective, especially for a game released 3 months ago. You can tell that these people REALLY love their game. There are just a lot of them. You know, approximately 90 thousand fans pushing this game for victory. To finish it off, should Undertale have won the title of ‘Best Game Ever’? Of course not! All of the quarter-finalists have made a huge contribution in the gaming industry: SSB Melee for bringing the competitive fighting scene to many players, Super Mario 64 and Ocarina of Time for setting the standards for 3D video games, the list goes on! Undertale simply built upon it, and its only contribution is its obsessed fans spreading the disease to every big name. Is it a good game though? Don’t ask me, I’m not going to play that game until a loooong time has passed (and Ludwig maybe won’t, either). It’s clear without the shadow of a doubt that Undertale winning the entire competition is a salty move. And sure, while KoopaTV doesn’t have ‘Best ___ Ever’ awards to offer, they do have the ‘___ of THAT Year’ awards (here’s a link to 2013’s and 2014’s, for your convenience). And to help YOU not get distracted by our friend, the Internet, from its many influences, leave some time dedicated to reading this article on time-management! Ludwig did end up producing what the Best Game Ever contest would look like if he was the only voter. Ludwig also believes that Undertale's power comes from memes which will dissipate in due time. For your convenience, here are the Game of THAT Year 2015 award nominations. Undertale appears. Undertale will become even more popular with its PlayStation 4 release. So would you suggest waiting a year for games to be entered in these sorts of contests to see if they have or may potentially have any lasting impact? I can understand why seeing it forced everywhere may put someone off. I remember in the old forum I used to go to I was obsessed with Ace Attorney and some other fans in that forum talked about it everywhere to the point that someone may have been put off forever. I felt bad about it ever since and I have insecurity issues when it comes to talking about my latest obsessions. It's very hard to contain myself and I feel frustrated keeping things I adore to myself. First impressions are everything. I knew the Ace Attorney series thanks to someone on YouTube, influenced by this site, and I just bought it now. If someone saw everything Ace Attorney in one place, he or she would probably think that, "Oh, this is where all the fans meet up!" However, Undertale was exploding, as many YouTubers did live streams, writers were covering it, podcasts used it as a background feature... Maybe if they slowly started spreading to players (like a plumber game), but seeing these everywhere (and I mean everywhere) tick people off! And yes, I would prefer for the contest to be next year, but it's GameFAQS' 20th Anniversary. Actually, there aren't that many Undertale fans at all. 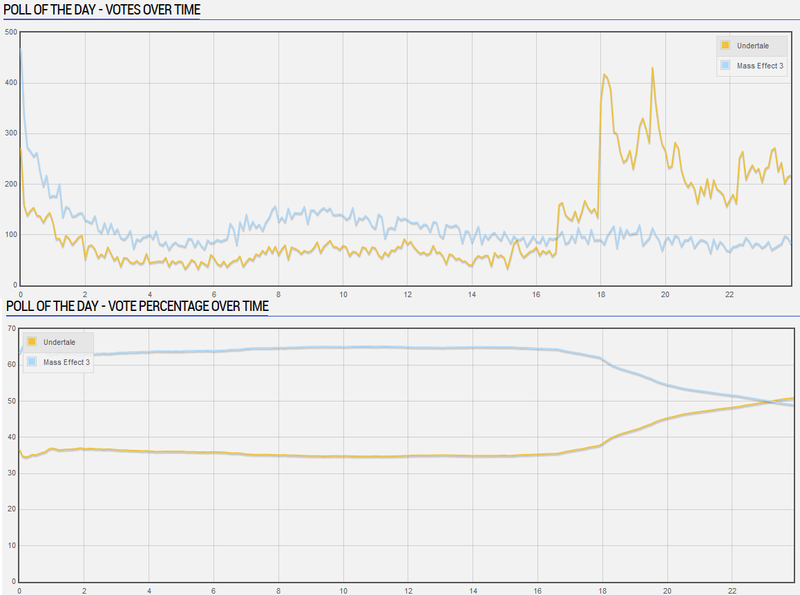 It won because of bots, Undertale communities had them set up during the ballot. But no, as someone who HAS played the game, I assure you it is actually pretty terrible. 'kay, I'll comment here because I feel like I need to. What is your evidence of this claim? GameFAQs's own admin refutes that idea. There was also a past GameFAQs contest where one of the entries was vote stuffed and those votes were removed. I forgot who or what it was but the point is that things can be done about bots as well. The votes removed this contest was actually some of Super Smash Bros. Melee's. He lied. There's more than enough proof otherwise, they were literally making twitter posts about it and posting screen caps while it was happening. I find it strange that he would accuse fans of an extremely popular and critically acclaimed game of cheating. It comes off like he's deflecting the issue. If I had to guess, Gamefaqs had something to gain from turning a blind eye to this. I know YouTubers are milking the game for all it's worth for views, and the Undertale fanbase is the group of people who click on things online all day instead of actually... you know, playing games. There was a Twitter post featuring Undertale people joking about that, but no solid proof of it happening. I dunno man, if you got those screen-caps and stuff, then supply 'em. Everyone knows that the Undertale people are the types (and we can see this right now with GameFAQs's regular poll of the day vote totals — they're doing their GOTY 2015 polls right now starting January 1, which is nice) to immediately leave after the contest is over. All the rallied people are no matter the fanbase, pretty much. What would GameFAQs/CBS Interactive gain from letting Undertale cheat in a contest with $2,000 in prizes? Especially if Super Smash Bros. Melee's fanbase legitimately won. Then wouldn't they want the legitimately-higher-populated fanbase to stick around for the next round if they wanted the page views?